Tips: Place more weight on the gripedo until you reach a resistance level you would like to work with. Tips: Use a thera band elastic band that stretches about 50% or 100% in weight. The breaking motion resisting against downward momentum requires more strength to hold on to. Gripedo Arm Extended External Rotations by Eric Wong, DPT. Note: This exercise is created by Dr. Regan Wong and uses for rehabilitating MLB pitchers. Tips: Only use one hand for the roll up and start with light weight. Note: This exercise is great for grapplers. Dan Strauss stated one of his favorite set up is using his two hands to grip his opponents forearm to control (two on one grip) his opponent. This can be a sport specific exercise simulating a grip on opponents forearm. The 4 inch ball on the end simulates opponents fist. Note: This exercise builds isometric strength. Builds a strong “squeeze” strength that may aid grapplers for submissions. Try experimenting with forearms parallel to the ground and with elbows closer to the ground as in picture. Note: User a thing band for carries. The downward momentum created by bouncing makes it more challenging. Tip: We recommend testing with barbell placed at different heights from the floor. When the gripedo on barbell is placed higher from ground, this makes it a great endurance workout since the distance the weight needs to travel is increased. Tip: use a short band to attach to kettlebell. Note: To perform this exercise grip the gripedo 2.25 inc center and turn in cloc wise or counter clock wise direction. This can be used by athletes that grip a bat, hockey stick or golf club but can be used by anyone trying to improve overall arm strength. Note: fatbastardbarbell.co makes a short loading pin that works for this use. The loading pin you chose to use needs to accommodate a .625 inch hitch pin. In future we plan to carry short loading pins on our website for this use as well. Note: This exercise is inspired by an exercise Martin Rooney’s Training for warriors book. Martin uses a 2.5 inch RollingThunder handle with similar set up. 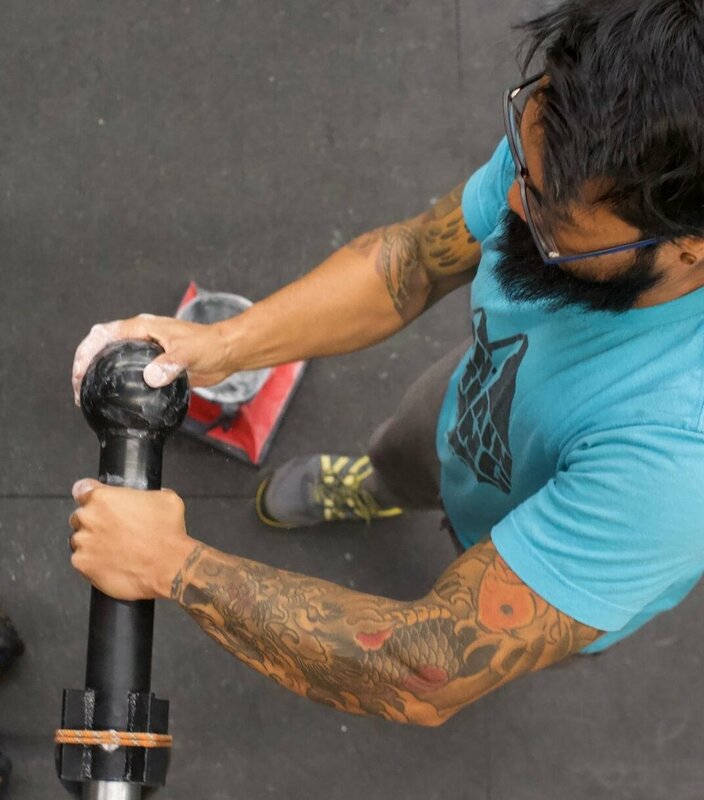 Note: In this set up barbell roll up is done by gripping the ball thumb up Inside the palm should be in line with the barbell and gripedo. This work grip and muscles in the wrist that are responsible for ulnar and radial flexion. Forearm for the hand that grips the ball end should be perpendicular to the barbell. This should feel similar to opening jar. Note: Gripedo center piece is wide enough to allow to hands to use as a wrist roller. Two hands shall grip the 2.5 center piece. The string/trap shall roll up on the fins. Gripedo ball barbell exercises can be done in various ways. In this one the torso of user is parallel to Gripedo and unlike regular ulnar radiation and deviation in which the forearm is perpendicular to the bar, in this exercise the forearm is 45 degrees in relation to the bar. Tips: This one can be done as flexions as well. To add weight you can ad a short chain link. 2-4 ounces goes a long way for this exercise. Note: This exercises inspired by double plate bicep curls. This allows a slowly transition and gripping the 4 inch ball challenges grip. For additional weight you can use short chain links for a few carabiners as in the video. This is an advanced exercise. This can also performed with palm facing down (reverse curl style and it trains wrist extensors when performed in this this fashion. You may also do wrist flexion with elbow 90 degrees to develop the thumb strength. Tips: Try using a ankle weight that has a rubbery surface for friction. Place the weight around the 4 fins of the Gripedo tighten the velcro. Make sure to use a ankle weight that is loadable by 0.5 lbs increments. You may use a chain and carabiner to connect to the one hole on fin of the gripedo and attach to weight. You can use other fin to lift the weight off the ground working finger strength. The fin is .25 inches thick. You can also clockwise and counter clockwise do a roulette style turns for time.